English horseback riding has been around for centuries. Over the years, English riding has evolved from a mode of transportation in Europe to a enthusiast sport that consists of an assortment of different horseback riding disciplines. Students who wish to learn how to ride English will have to choose a specific discipline once they have mastered the most basic beginning riding skills. Huntseat is a style of English riding that has its origins in the sport of fox hunting. Many English riders start their riding education by riding huntseat and then progress to a more complicated or specialized discipline. 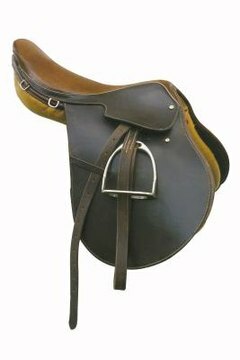 The huntseat saddle is known as an all-purpose English saddle because lower-level riders can try to succeed at multiple events using this generic piece of equipment. Huntseat is the basis for all jumping disciplines, and new riders have to master basic huntseat equitation before they can graduate to more complicated events. Huntseat is also known as hunters or hunter seat equitation. Jumping is the English riding discipline most easily recognized. Riders jump horses over obstacles of varying height, either in an arena or on a course, from 18 inches high to taller than 6 feet. Both cross-country jumping and show jumping are Olympic events. Jumping requires a high level of skill and control from the rider. Accidents are inevitable; jumping is not an English discipline for the weak of heart. Dressage is an English riding discipline that takes place completely on the flat. Dressage has its own saddle, which encourages the rider to maintain a longer leg and deeper seat. Dressage saddles are never used in jumping. The position of a dressage rider is more like that of a Western rider than that of a huntseat rider. Dressage focuses on getting horses to travel as effectively as possible under saddle. Dressage is also an Olympic event. Eventing is a combination of three different riding disciplines: cross-country jumping, show jumping and dressage. Large competitions take three days, hence the common name three-day eventing, with each horse and rider being expected to perform a different event each day. Each horse-and-rider team participates in all three events and is judged on the final score to determine the true winner of the competition.